oh, wow. precious. heart warming. awesome post. Well, Jen, I wish you were just around the corner too. I think I could easily take you on as my "second daughter." One of the things (it's a very happy thing) that I have not been able to blog about is my precious little Granddaughter. I do mention her but I've never shown a picture of her. Our son and his wife adopted her at her birth almost a year ago and they do not go to court for the final paper signing until another month and have chosen not to place any pictures of her on the internet at this time. I could write a hundred blogs about her and how the Lord led and directed in the whole adoption process. It is a beautiful story that I hope to be able to share one day. I'm not even sure where you live but would love to think that one day we would be able to meet face to face. You have been a blessing to me through your wonderful blog! Praying the rainbow of His promises and the comfort that only He can give to you will rest on you today. Praying for you! Oh Jen, I'm so sorry for your loss. The absence of someone after a lifetime of strong presence is so difficult. I pray you'll make peace with her loss, and with God, slowly and fully. Very well spoken words. It is hard to wrap our little human heads around death. I am sorry for your loss. May God guide you and comfort you today. When you write about your grandma it is very raw...I can almost feel how much you miss her. It is a cloudy time, but slowly, the clouds will not feel as heavy and hopefully, a little sunshine will peek its way out. Oh Jen..sweet sweet lady..I wept while reading this post. I know precisely what you were feeling as you wrote these precious words. I too profoundly loved my maternal grandmother. I promise to lift a prayer for you..and I hope soon you will find comfort to ease your sadness. Jen, how beautifully you paint a picture of your relationship with your Grandmother. I'm sorry for your loss. Thank you for sharing. I lost my grandmother last year, and while I know she is in a better place, it doesn't make it anymore difficult to be reminded that she is not here with me. I pray that the Lord brings comfort to you. I look up to the clouds quite often...sometimes I pretend that if I look hard enough I'll see my dad looking down.....sometimes I look up and in my head say..'are you there dad'? My nana was also very precious to me..we spent almost every afternoon visiting, having tea...she would listen to all my troubles...always listening, never bawling me out....I loved her dearly and can't wait to see her again. Hi Jen! First of all I see your incourage bloggy bling, and I am fixing to add mine :) What date are you featured on? Mine is September 26th! Jen, I can truly identify with your grief. May the Lord make himself very real to you at this time! Your art is incredible. Thanks so much for stopping by my blog. I'm reading and feeling many emotions. It has reminded me of my great grandmother and my precious relationship with her. It also reminds me of the relationships I help to cultivate with my own children and their grandparents and the joy that it will bring them. 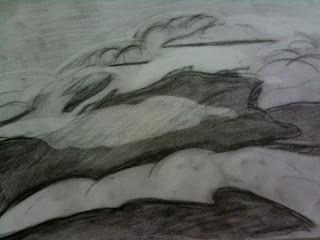 PS: I loved your charcoal drawing it truly shows the clouds and represents your range of emotions your going through. Jen, I can relate to this all too well -- this is the path I'm walking -- and will be walking for quite some time -- these days. Beautifully written with hope and peace. After my Mama died, my Grandmother filled the space as best as she could(she still does!). I can't imagine life without her but I know it will come. You wrote about greif so beautifully. It doesn't seem like grief and beautiful should be side by side but I think that, at times, we are most beautiful to our Saviour in our grief. I also wanted to say that storm clouds are often not the most beautiful clouds and I think you captured your storm clouds just as you needed to see them. A rolling, tumbling mess of emotion that will one day become a beautiful blue sky with brilliant white clouds. Praying for you in this moment. Beautifully stated, dear one. I lost my father nine years ago and while it most certainly is not quite as raw as it was soon after his death, the clouds do still move in. It's the risk we take when we open our hearts to love and it's so very worth it and yet so very hard. I'm late in posting, I know, but I wanted to add this caveat...did you know that Native Americans (specifically, the Lakota, Dakota and Nakota peoples, known to us as the Sioux) observe a one year period of mourning? Everyone in the community knows and expects that a person be in morning for the full year from the date of a loved one's death. Of course, the grief lasts beyond the prescribed mourning period, but I've watched as my friends observed this year. It's amazing what happens when an entire community gives you permission to be angry, sad, depressed, joyful, angry again as you work through your loss. The freedom of that permission actually speeds up the grieving process, in my opinion, enabling the griever to re-engage fully in life more quickly than those of us who try to grieve for a week, a month and then go back to work, act like everything's normal, move on. I am glad you are still grieving, still sharing your grief. I am glad you have given yourself permission. I am so late in all my visiting this week, but I wanted to thank you for stopping by, and thank you for this post. It is beautiful, honest and one that so many of us relate to. You are not alone. Blessings on your day.